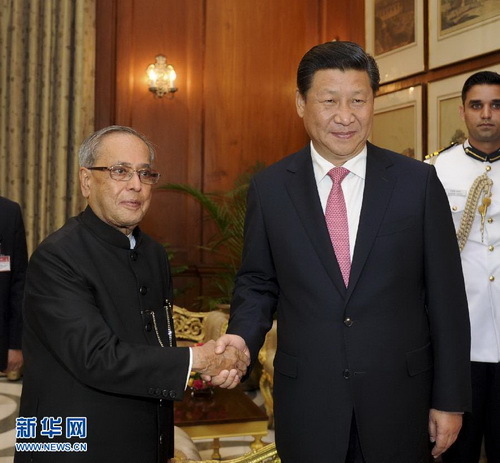 On September 18 local time, President Xi Jinping met in New Delhi with President Pranab Mukherjee of India. Xi Jinping expressed that I am grateful for President Pranab Mukherjee inviting me to visit India as well as the gracious hospitality and considerate arrangement offered to us by the Indian government and people. Through this visit, I have deeply felt the time-honored history of bilateral exchanges and the profound friendly feelings between the two peoples. Both the Indian leaders and I agree that China and India both are emerging markets in the historical process of national rejuvenation and are important forces in world multi-polarization, hence developing China-India relations is of important strategic significance to both countries, Asia and the world. China and India should deepen strategic mutual trust, enhance practical cooperation, strengthen people-to-people friendship and properly manage and control differences, always advancing bilateral relations along the right track of healthy development. Pranab Mukherjee said that today, President Xi Jinping and Prime Minister Narendra Modi had fruitful talks and both sides reached multiple important consensuses and signed many cooperation agreements. He is happy for this. The total population of India and China accounts for one third of that in the world, therefore, the two countries co-existing in peace and joining hands for development are of great significance. India is willing to, together with China, enhance exchanges and cooperation, take care of each other's interests and concerns, and properly handle the pendent issues, so as to jointly build India-China strategic cooperative partnership for peace and prosperity. India is devoted to maintaining the rapid economic growth and welcomes China to intensify investment in India in information industry, manufacturing and transportation infrastructure construction such as rail, road and port. India will provide a favorable investment environment for Chinese enterprises. 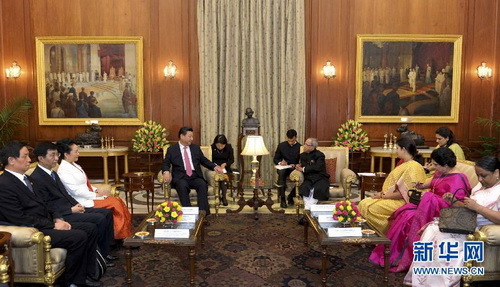 After the meeting, Pranab Mukherjee held a grand state bouquet for Xi Jinping. Prime Minister Narendra Modi, Vice President Mohammad Hamid Ansari and other Indian political heavyweights as well as personages of various circles attended the event. The national anthems of both countries were played on the scene. The two heads of state delivered enthusiastic speeches respectively. Xi Jinping stressed, there is a Chinese proverb "a good neighbor is better than gold". We would like to always live in harmony with the Indian people and seek common development. This is common aspiration of the Chinese government and people. I firmly believe that under the joint efforts of both sides, China-India strategic cooperative partnership will surely and constantly achieve new and greater development, thus to make positive contributions to a brighter future of the two countries as well as to progress and prosperity of the region and the world at large. Pranab Mukherjee expressed that the Indian people admire China's great civilization and huge achievement, and sincerely hope China continue moving forward and make greater contribution to peace and prosperity in the region and the world. It is crucial for India to develop mutually beneficial cooperative relations with China if it is to benefit from the development in Asia. India stands ready to join efforts with China to constantly promote bilateral relations to new highs and realize common development and prosperity. He wishes that the friendship between India and China, the two ancient civilizations, could last forever. Peng Liyuan, Wang Huning, Li Zhanshu and Yang Jiechi attended the above events.